How Successful Is Artistic Activism? The hardest assignment you can be given at Concordia right now is finding ways to keep students who are on the fence about a strike engaged and involved in the cause. For the Faculty of Fine Arts, finding new and creative means to up student participation and engage students of all faculties in the strike has been priority number one, but it’s a task as daunting as any finals study marathon. The Fine Arts Student Alliance has unanimously been voting to continue the strike action week after week since early March; after the Women’s Studies Student Association, theirs is the second-longest student strike at Concordia. 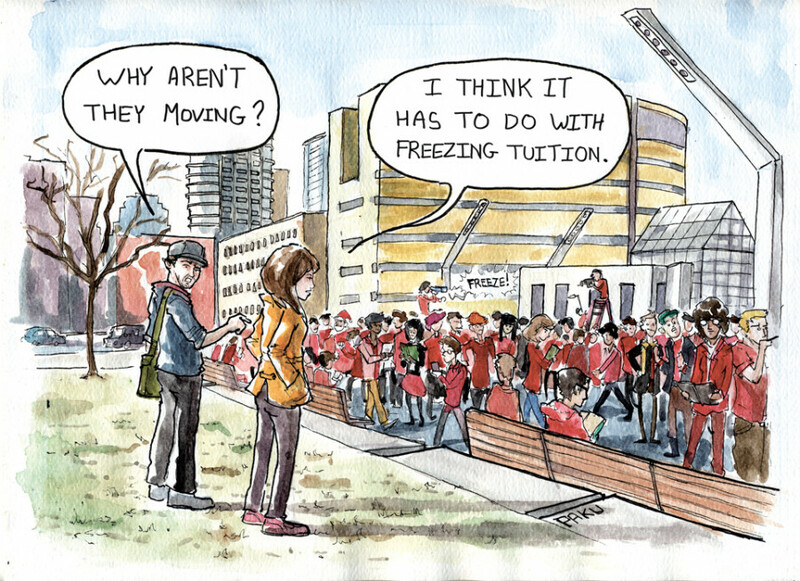 Whatever your opinion on the success of the strike so far—student apathy, minimal participation and lack of organization from the Concordia Student Union were a few problems vocalized early on—it has to be said that many students are successfully activating their peers within the movement. This strike has been polarizing, pitting students against students and friends against friends in the vocalization of what they think is right. I’ve argued with my own friends about our stances on the strike, and I’ve seen the arguments get ugly. I began checking out some of the creative protests that were happening around campus for the Fringe Arts section, and the results were, at first, kind of disheartening. While I appreciated and commended the feeling behind many of the events organized, it appeared to me that a very small number of students were actually making it out to the events. However, after speaking with several involved students, as well as Nicolas Martel, a member of the fine arts platform Artists Working to raise Awareness & Knowledge about Education—who have been responsible for organizing and getting word out about the numerous creative strike events—I can recognize the good behind the artistic efforts. Activism is visualized in many ways, and since their original vote on March 2, fine arts students have been proving that there are many ways to tackle this issue. Groups of FA students have been coming together for the entirety of March, organizing theatre and dance performances, zombie marches and street parties, and other faculties are starting to follow their lead. The English department held an open mic on Wednesday afternoon in the sunshine on de Maisonneuve Blvd. Other students are hosting workshops in their apartments or in other public spaces. The strike continues, but that doesn’t mean that the learning has stopped. In the divisive atmosphere of this strike, creative efforts have been bringing students back together, and making us realize that no matter our opinion, we are all in this together. We all still want to learn and create, and we want our education environment to be accessible. “Creative forms of protesting are creating vitality and dynamism in the public environment around the university. Most of the involved people I’ve spoken with have said that they are creating lasting bonds and friendships with each other that will last throughout their degrees,” said Martel. With the success of last week’s peaceful student march, which saw hundreds of thousands of Quebec students take to the streets, it’s obvious that students aren’t backing down. Wherever you stand—pro- or anti-strike—creatively protesting has opened up a dialogue, and has created an engaging way for students to come together and to let their voices—and opinions—be heard.